on my desk to prove that fact to myself that I am not totally nuts!. a second operation on the same point that things go wrong. hole machining process as expected. these new features in version 5.50? Hi Robert, It does sound a bit odd, and I've not had any reports of problems like this from any of my customers. I am running build 5.51 and have just put together a drilling and counterboring project and it all appears to function correctly, so perhaps it has been sorted for the later build. If you can post up your project then maybe someone else who is running the same build can give it a go to confirm the problem. Thanks for the response... I'll attempt to attach my project and output files below. Hi Robert, I have tried your project in the latest build 5.51 rev 23449 and it appears to work correctly so I would suggest updating to this build (rev). 1: although you are using imperial units you have a Tolerance (Digits) of 3 which really needs to be set to 4 when using imperial. 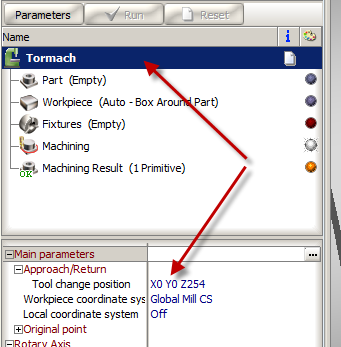 2: you have a toolchange position for each operation, this can be set just once right at the top of the list (Tormach), and the Z position must be higher than the tool overhang amount. Thanks for the tips and for trying my project file. It's good the hear that the project was Ok and that it was a bug in my software version. Hopefully, Sprut will send us links to the latest release shortly. Would you please explain further how to set the tool change posiiton "at the top of the list"? Thanks for the tips, I'll give them a look this evening to see if they can help. I just received a note from Sprut and they think it looks to be a bug in the postprocessor. I'll post back with my results as I learn more. Thank you to everyone for all the effort thus far. The problem still persists with the postprocesser I received from Sprut this week. I did some additional investigation and discovered that the post file on the Tormach web site, the version included with 5.50, and the file this week from Sprut are all identical. I used a software development tool Beyond Compare to verify that all of the post files were the same even though they had different dates and file sizes. This is not to say that the post file is not the issue, it's just that of all the ones I could locate that was the case. I just received the link to SC version 5.51 and that appears to have solved my machine hole drill issue. Thank you to all of those that helped.